Photo: Dogs have masters; cats have staff. This morning I read in Romans about how God used Pharoah. It says God actually raised Pharoah up to that position for a reason. I wonder if God allowed a megalomaniac to rise to a position of power because it was time for a public show-down with a human who actually believed he was in charge. God told Moses what to do and what to say, then added, “Oh, by the way, Pharoah won’t listen.” Moe probably felt like middle management. Pharoah refused to change because he refused to learn. He arrived at the point of contact with Moses and Aaron in a state of being incapable of changing his mind. It just so happens this cat in the photo is named Ramses, after a Pharoah of Egypt. He is an exceptional cat because he does play fetch — with an alarmingly realistic replica of a dead mouse — but he deigns to participate in this exchange with us mere humans on his own terms and in accordance to his mood swings only. He performs for no man. His demeanor reminds me of people who consider themselves to be experts in all fields which matter. If they are not experts in a particular field, it is because that area, in their opinion, is not of importance. 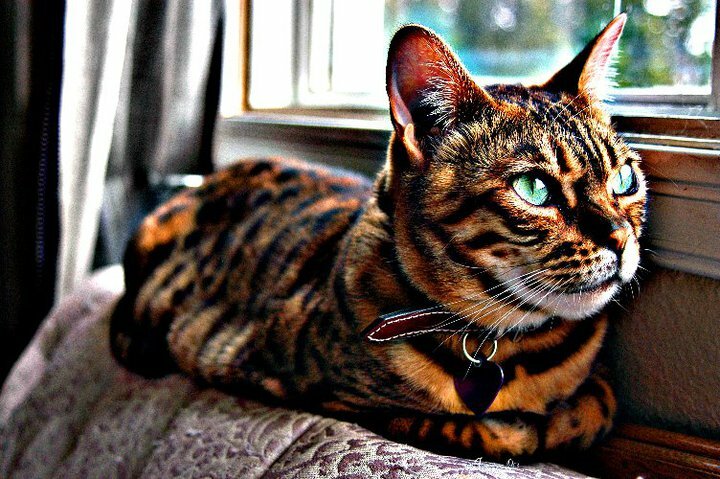 The Bengal breed is beautiful. Their markings remind us they are not that far removed from the wild. They are gorgeous animals and tend to be more aloof than the typical house cat, but like most cats they are not compliant. They are not meek. Woe betide if breakfast is late. I don’t think , when meekness is mentioned as a positive character trait in the Bible, that it refers to a doormat, a milk toast, or a namby pamby, wishy washy victim. I think it refers to a person who humbly admits he or she is not an expert, but is confidant in her or his potential and knows she or he is capable of learning. Don’t mistake meekness for mildness or timidity. True meekness is unswervingly honest, ferociously courageous and undauntedly thorough. Meek people are never resigned to hopeless stagnation in mental, emotional or spiritual slavery. They realize that gain comes through the willingness to let go of lies which have remained unexamined for too long. A lack of meekness was the central weakness in Pharoah’s character. He was the victim of an attitude that was not teach-able. It was an arrogant attitude that mistook stubbornness for perseverance. I believe the attitude developed as his own original choice, but after it became entrenched, God chose to exploit it, and hardened his heart further. Only God knows at what point some people’s rebellion solidifies into unmovable arrogance. Not my job. Not going there. My job is to remain soft-hearted, malleable, willing to admit ignorance, and to be confidant that I am capable of learning — meek. My job is to be honest about my weakness and co-operate in the mind renewing process. Isn’t Ramses II sometimes named as the pharaoh of Moses day? Well, he is in the movies. Beautiful cat but your words are very inspiring. Thank you so much for your time you take to let us aware of spiritual matters. Preaching to myself, Beatrix, but willing to share. Thanks for your encouragement. Your words are like salve to the soul. Thank you, C.C.T.. God is good. Thanks for sharing that description of meekness. It’s a great reminder. BTW. I am a cat person and that cat is very cool. He would agree. Thanks for visiting, Mr. jwswift. I never searched into the meanings of certain of God’s Word, words. Meekness was one, an archaic terms, Bible words, non-applicable in my life – IGNORANCE! Probably if asked then I would have defined it as always apologizing, did a lot of that, then. When I was taught that “meekness” meant strength under control it was a beautiful revelation. No apologies for my God-given strengths but one of the gifts of His precious Holy Spirit is “self-discipline:. Your expansion on meekness here is helpful.